Hope you are all finding some time for creativity! I'm writing in between Trick or Treaters. They are so cute. Even the middle school kids are polite and nice. 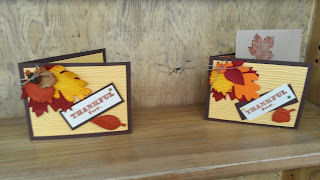 We had fun this week with the Art Gallery Stampers using brown grocery bags, of all things!! They make beautiful backgrounds with a pretty embossing folder and some gold ink! You can also run them through the Big Shot with the Bigz Blossom Party Die and voila, perfect flower cutouts--free!! We also made a great Starburst card that has so many possibilities. As some of the gals were saying, "A great way to use my DSP scraps!!) So true. I can't wait to make more of these!! Our am gals, Barb, Donna and Jane! Such fun! grocery bag! A great way to re-cycle too! and yet a little different!! rotary trimming blade for the new SU paper trimmer. in a cute SU Halloween treat bag. elegant and really easy to make! Classy gold! design! Like you--it is classy and very pretty!! Thank you, everyone, for a wonderful week! TAL--we're back together this coming Thursday.